CONCUSSION MATTERS is a show about concussions and post-concussion syndrome, education, awareness and management, as well as therapies, and other related topics. Each month will feature a guest who has been involved with concussions, pcs, or brain injuries in general. 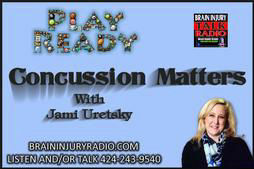 ​Link to download: http://www.blogtalkradio.com/braininjuryradio/2017/09/15/return-to-learn-on-concussion-mattersaph here. Concussion Mitigation Technology’s, LLC featured product is the Smart Cap®. This cap, weighing less than 4 ounces, goes on the head before a helmet is placed on the wearers head. It contains impact and bio sensors that are transmitted wirelessly to a smart phone or other personal electronic devices.